Under tile DIY cable mat kits are ideal for installation under tiles or stone. This system is used when no sand and cement screed is being installed and the tiles are being directly ‘stuck’ to the floor surface. The mats have a self-adhesive backing, making them very quick and easy to install in large rooms and other open plan areas. All mats are 50cm wide. 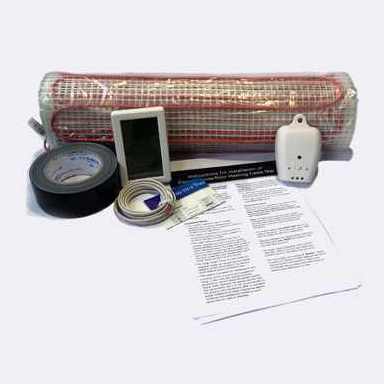 All prices quoted include GST, floor heating mat, floor heating sensor, cable alarm, high tack cloth tape, standard electronic programmable thermostat and detailed installation instructions.